Newtab.club is the PUP that uses misleading techniques to prevent removal. Use Reimage to locate malicious components and get rid of them faster than with uninstall instructions. A full system scan blocks virus reappearance and prevents traffic to malicious domains. Why does the Newtab.club virus hijack computers? How do the hackers disperse the virus throughout the web? 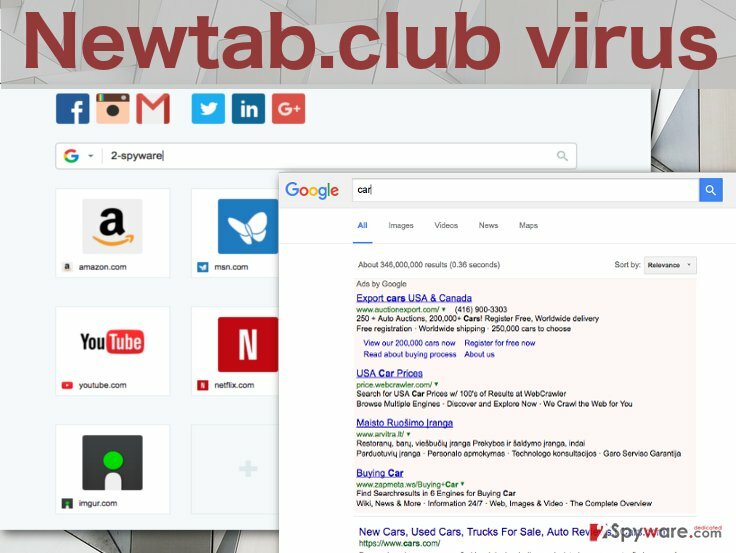 Newtab.club virus is browser hijacker that takes over browsers against their owner’s will. Then, it tries to lure the unsuspecting users into leaving this suspicious search engine set as their homepage and continuing to use it as their default search provider. The problem is that this virus creates an impression of a completely reliable and handy tool, so many users fall for this trickery. There are plenty of useful features it offers. For instance, the initial page of this search site is filled with the so-called speed dial links providing the user with quick access to his/her favorite social networking sites, such as Facebook, Instagram or Twitter. Through this site, you can also immediately reach your email and other sites which can also be adjusted according to your needs. Another handy feature — this search provider is not limited to one search engine and offers a variety of them to choose from. However, here is where the things start getting suspicious. 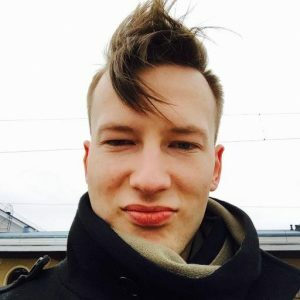 Among the completely regular websites such as Google, Yahoo or Bing, the users are also offered to visit suspicious Russian domains, including go.mail.ru, yandex.ru and nova.rambler.ru which are associated with the majority of browser hijackers that are targeted towards Russian-speaking users. It might be that this way, hackers that promote these websites try to involve even more users into their shady business. And these are not even all of the reasons to remove Newtab.club from the infected computer. This browser hijacker is not only equipped with the ability to replace your default search engine and homepage. It will also spy on you and track every website you visit, every page you view and record what you look for online. This information may later be used for the development of Newtab.club redirect capabilities or simply be sold to the third-parties to serve advertising purposes. Either way, your data will not go to waste, so to say. What can also become problematic during Newtab.club hijack is the overall system’s performance. And that does not involve browser malfunctions only. Other applications installed on the computer may begin to malfunction, freeze or crash. The processes that took just a couple of seconds may draw into minutes or even fail to perform at all. This is not a behavior of a reputable application. This, we recommend you to get to the Newtab.club removal as soon as you have the chance, because delay may result in even more damage to your computer. To perform the elimination quicker, please use Reimage or other anti-malware utility. Though some users tend to mystify it, in reality, there is nothing special about the Newtab.club distribution. Nevertheless, this does not outweigh the fact that the way this PUP enters computers is deceptive and dishonest. If you have ever heard of “bundling,” you probably already known what we are talking about. This deceptive marketing technique allows spreading Newtab.club malware in a single software package together with other freeware. Such bundles are mostly promoted via popular and even completely reputable software distribution websites, including softonic.com, soft32.com, download.com, cnet.com, etc. In such packages, unwanted components gain the matter “optional install” status and install along with the main program. Such unwanted attachments can be opted out only in the “Advanced” or “Custom” installation modes which are recommended to opt for when installing some new software on the computer. Newtab.club removal might initially seem overwhelming, but there is actually nothing to fear of. You just need to closely follow the guidelines and the Newtab.club will be good as gone. If you choose this manual removal approach, check out the instructions our experts have prepared below. Nevertheless, it is also possible and even recommended, to leave the virus removal to the professionals. That does not mean you will have to physically carry your computer to a technician. You can install a reputable antivirus application which will remove Newtab.club automatically for you. Such elimination is much more precise and faster. Newtab.club removal may not be difficult but it requires close attention. You must find this hijacker hiding on your computer yourself. To do that, please look through your recent installs and if you notice any suspicious applications which you did not install yourself — investigate and, if needed, uninstall them. Here, look for Newtab.club or any other recently installed suspicious programs. Wait until you see Applications folder and look for Newtab.club or any other suspicious programs on it. Now right click on every of such entries and select Move to Trash. When in the new window, check Delete personal settings and select Reset again to complete Newtab.club removal. Once these steps are finished, Newtab.club should be removed from your Microsoft Edge browser. Here, select Newtab.club and other questionable plugins. Click Remove to delete these entries. Now you will see Reset Firefox to its default state message with Reset Firefox button. Click this button for several times and complete Newtab.club removal. Here, select Newtab.club and other malicious plugins and select trash icon to delete these entries. Click Reset to confirm this action and complete Newtab.club removal. Here, select Extensions and look for Newtab.club or other suspicious entries. Click on the Uninstall button to get rid each of them. Here, look at the Homepage field. If it was altered by Newtab.club, remove unwanted link and enter the one that you want to use for your searches. Remember to include the "http://" before typing in the address of the page. Now you will see a detailed dialog window filled with reset options. All of those options are usually checked, but you can specify which of them you want to reset. Click the Reset button to complete Newtab.club removal process. This entry was posted on 2016-11-09 at 06:29 and is filed under Stealing programs, Viruses. You can quickly scan the QR code with your mobile device and have Newtab.club virus manual removal instructions right in your pocket. How did you remove Newtab.club virus?